There are so many good things going on in Zorange it is hard to keep up! Let me share a few as you all have been partners in the growth. For many of you who have been with Hope for Haiti since the beginning I thought you would appreciate an update on Madeline Gorge. (Pictured right) Mary Ellen Decker has told the story of this girl who was brought by her Grandmama to one of the first yearly medical clinics. She was emaciated and weak. With the support and care of the volunteers she survived and the next year returned just to visit. Madeline is now 12 years old and doing well. 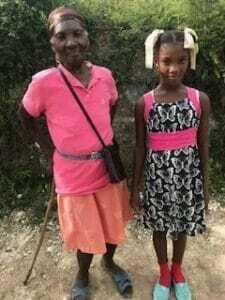 Her Grandmamma reports with a smile that she is doing well in school, gets all her immunizations and is healthy. The maternity center is almost completed. This will give needed space for exam rooms, overnight stays and care for the many deliveries and prenatal care given in our clinic. Women arrive at all hours on foot, donkeys, or by moto and soon will have a better space to labor and rest before their return. Our midwives have received valuable Ultrasound training and we are looking for travelers who are specifically skilled in OB ultrasound to continue this training. Part of the midwifes everyday work that I happened to witness was determining the best care for pregnant woman who also had a cardiac condition and the labor of a woman with her eleventh pregnancy who was at high risk of hemorrhage. It is amazing what our staff handles with very little resources. January will bring the long awaited first Dental care in Zorange!. Thanks to the long time support of Dr Gacioch and friends at Rochester Regional Health. Patients are already lining up. Our surgical team has become a well oiled machine and has earned the respect of the community in Bainet. They continue to bring needed surgery to those who would likely never get this care. We are so thankful for continued support. Our science lab capabilities are growing with the expertise of our lab tech Megdeunna. We have added a centrifuge and are hoping to add lab chemistries. Anyone have a generous lab connection? Again thank you all for what you do and please remember Hope for Haiti Foundation on Giving Tuesday!